April 17, 2018, Fort Wayne, Ind.–When home-schooled, high school junior Mitchell Skees decided to take the first steps to form a software development and app business, he contacted The NIIC. At that time, receiving a prestigious award had not entered his mind. Fast forward two years. Today, Skees, Founder and CEO, 3B Apps, was awarded the Mirro Student Founder Award at The NIIC’s fifth annual Ideas@Work Signature Event at Parkview Mirro Center for Research and Innovation. “We are incredibly honored to be part of the SVL Program at The NIIC. Thank you for this award and for those who have made this program possible,” said Skees. 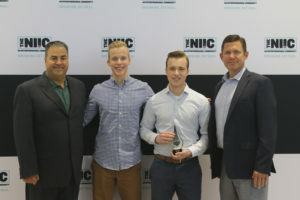 Established four years ago, The Mirro Student Founder Award recognizes the top, outstanding performer of The NIIC’s Student Venture Lab Program. The award embodies characteristics of The NIIC’s Founding Board Chair Mike Mirro, MD, including personal excellence, energy, passion, and making a lasting impact. “Mitchell and his brother Connor, who serves as the company’s developer, showcase the entrepreneurial attributes of Dr. Mike Mirro. They consistently push themselves to aspire higher and to never be satisfied. They both lead by example and continuously give back to the SVL Program. I am proud of what they have accomplished and look forward to what the future holds for them,” said Gary Fry, SVL Program Manager and Business Coach. 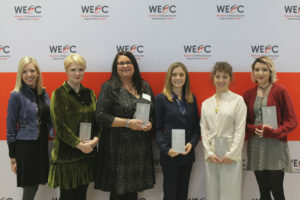 New at this year’s event, three, women-owned tech companies were recognized for completing phase one of the new WEOC Launch Women Business Builder Program. Companies who achieved this milestone include Rhapsody Art Gallery & Studio, LLC, Co-founders Tricia Cavender and Hali Ruisard; Simple Sample Solutions, Founder Melissa Hall; and Co-founders Morgan Refakis and Alice Payne, who are developing a business model for Pilate’s instructors and clients. “The Business Builder Program was established to meet the needs of online women businesses and to tech-enable traditional businesses for e-commerce opportunities. We are excited about the progress of these ventures and their future prospects,” said Leslee Hill, Director, Women’s Entrepreneurial Opportunity Center (WEOC). “Ideas@Work spotlights and celebrates the entrepreneurial energy in our community. Angie’s talk today inspires all of us to reach for our dreams, to be tenacious, to not be afraid to put ourselves out on a limb, and to surround ourselves with people who complement our strengths,” commented Karl R. LaPan, President and CEO, The NIIC. The annual NIIC Ideas@Work Event is possible through the support of leading organizations throughout the state. The proceeds of the event support the Student Venture Lab Program and WEOC. The NIIC appreciates and recognizes the dedication and leadership of the Ideas@Work Event Committee, including: Chris Rush, The DeHayes Group, and Committee Chair; Tammy Allen, The NIIC; Mike Altendorf, Do It Best Corp.; Otto Chang, PhD, Purdue University Fort Wayne; Phil Downs, PhD, Southwest Allen County Schools; Mike Fritsch, The NIIC; Karl R. LaPan, The NIIC; Tammy Sipe, The NIIC; Cody Walz, The NIIC; Daryl Yost, EdD, The NIIC. The entrepreneurial community is encouraged to save the date for the sixth annual Ideas@Work event to be held April 16, 2019, at the Parkview Mirro Center for Research and Innovation. The NIIC is a non-profit, vibrant entrepreneurial community. We help business builders and entrepreneurs launch and grow successful business ventures. Formed in 1999 by a consortium of community and government leaders and organizations in 2013, The NIIC was recognized by Entrepreneur magazine as one of the top four under-the-radar incubators in the country. This basically means Entrepreneur magazine, with the help of International Business Incubation Association, picked four U.S. incubators to highlight, and we were one of them. In their words, we “stand out in a state not always perceived as small business friendly.” The NIIC is the country’s only ISO9001: 2008 registered business incubation and acceleration program. https://theniic.org/. The Women’s Entrepreneurial Opportunity Center (WEOC) serves Northeast Indiana women at all stages of their business ventures. WEOC responds to the unique needs of women entrepreneurs through business growth coaching, training and entrepreneurial education, connectivity, and access to capital. In October 2017, the name changed to Women’s Entrepreneurial (instead of Economic) Opportunity Center to more accurately reflect what WEOC does. WEOC is funded in part through a cooperative agreement with the U.S. Small Business Administration. As the host organization, The NIIC also provides funding and supplemental and complementary resources for WEOC, one of two SBA designated Women’s Business Centers in Indiana. For more information, visit www.inweoc.com. The Student Venture Lab Program is supported by The NIIC Ideas@Work Signature Event and the generous support from our primary sponsors: Lincoln Financial Foundation and the Edward M. and Mary McCrea Wilson Foundation.